Frankenbike. 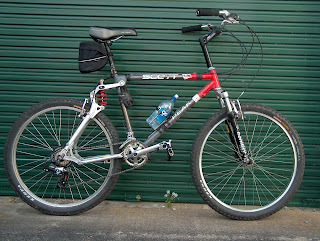 GT LTS 1 rear, Marzocchi Bomber front, Scott Peak middle, dutch shopping bike bars, cheap flabby Phillips seat, truly fantastic Kenda Karma tyres, various other bits of junk from the Bike Heap. No back ache, no arm ache, no neck ache, not very fast. I have now fitted tubeless tyres to Mrs My Wife's new mountain bike. You run a plastic liner round the inside of the rim to seal the spoke holes and fit the tyre with sealant inside. - Of course you don't do it yourself lest you get ucky bits of sealant on your fingers, not if the shop is kind enough to do the fitting for no charge, which my shop is, cos Josh is a Good Chap. Punctures deal with themselves until a big rip in the carcass requires an inner tube. Apparently. 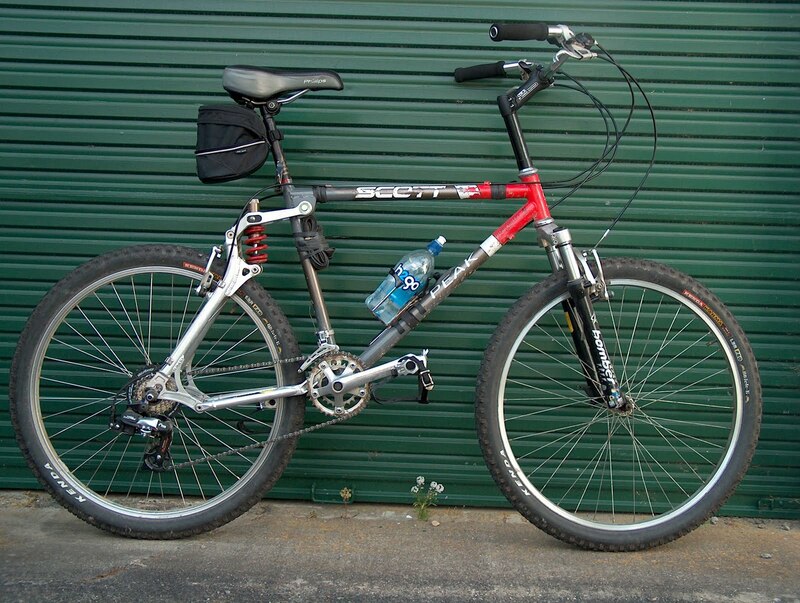 The rolling resisance, as compared by rolling down tarmac road hills together, is equal to what Mr Knight has taken to calling my Frankenbike which runs exceedingly thin-wall tyres. A bit disappointing since hers is a 29er and mine's a 26er, but then Frankenbike does roll amazingly well. But subjectively on the orchard dirt road, Mrs My Wife's 29er feels a bit like riding a racing bike on tarmac, and it feels much easier to ride than Frankenbike. Much easier. Frankenbike's tyres, for the record, are Kenda Karma. You can't get them in NZ any more. I have two pairs. We have a friend who is a perfectly good gentleman who - you will deduce - has a perfectly good gentleman's mountain bicycle (would it be a Giant Trance?) and when he last popped in I stole it and rode it round the orchard paths. He runs or'nery but good quality tyres which I believe he may have bought for their longevity, he being a fellow notoriously tight in the wallet department, and they were truly hard work to pedal. Thick side walls. Lots of hysteresis. 1. She has the wrong gearing. She should have the same gearing that his MTB has. 2. She has no back suspension. She should have back suspension the same as his MTB has. 4. Those great big wheels make the bike much harder to manoeuvre in tight corners. She should have the same size wheels that his MTB has.